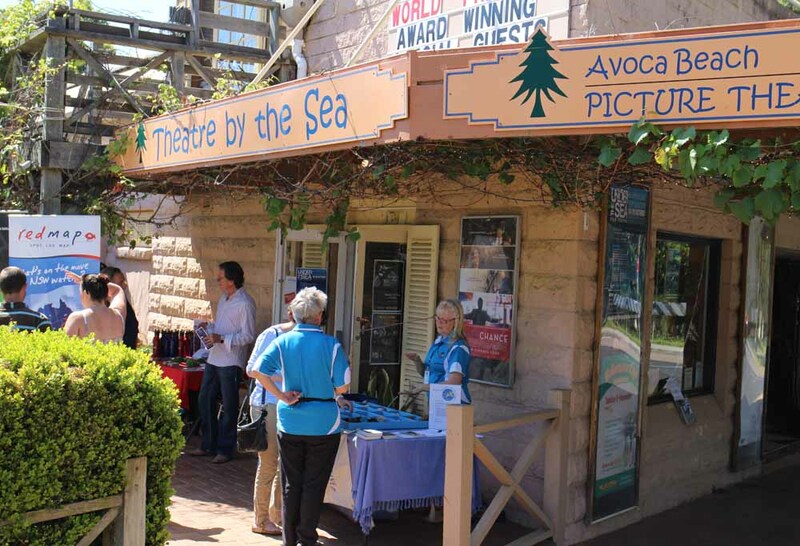 The historic Avoca Beach Picture Theatre, and perfect venue for the inaugural Under the Sea Film Festival. 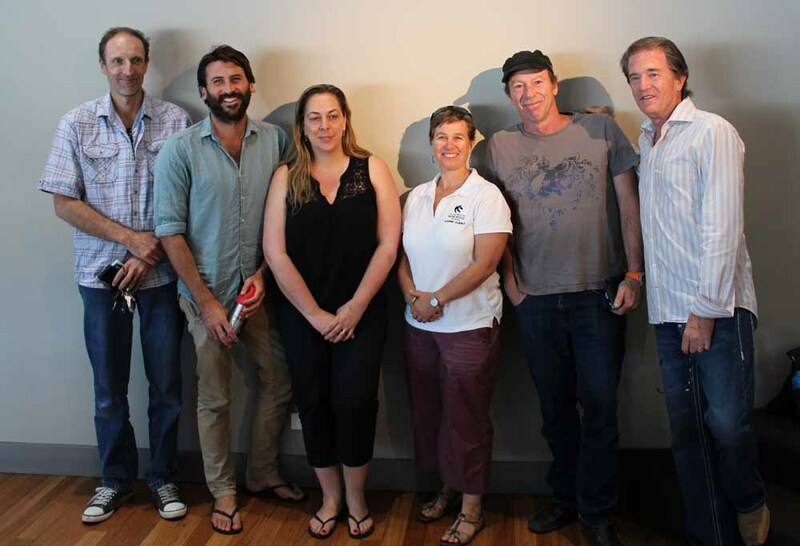 The Under the Sea Film Festival, held in the historic little Avoca Beach Picture Theatre, brought together documentary film makers, scientists and those of us with a keen interest in that blue fluid we spend so much of our lives swimming, surfing and diving in. Not just a showcase of beautifully shot films with engaging narration, the event brought together scientists and storytellers able to help communicate our concerns to a wider audience – citizens concerned about saving our precious oceans. It was also the launching pad for two important new citizen science initiatives. One will give every student, teacher and interested punter anywhere in the world access to the world’s largest library of underwater video and images. The other, Redmap, involves everyone with an interest in the sea, be that fishing, snorkeling, diving or pottering around rock pools, in contributing to an important nation-wide scientific survey tracking sightings of unusual fish via iPhone app. The selection of films on the program were both celebration of the beauty to found underwater, from Sydney Harbour to the Great Barrier Reef, and a wake-up call to all of us to do more to protect and conserve them before it’s too late. 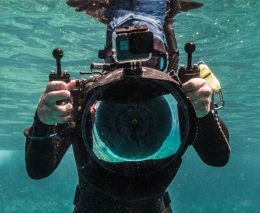 Coral Sea Dreaming, a film that reflects 12 years of filming by internationally acclaimed underwater cinematographer David Hannan, is a mesmerizing 60-minute music video illustrating the beauty and biodiversity of our coral reefs. 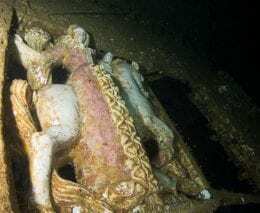 Beneath the Blue, another film presented at the festival by award-winning cinematographer George Evatt, takes a look at the unknown beauty beneath Sydney Harbour. Then there were several films looking at the different threats our oceans face. The Tipping Points: Oceans, part of a six-part series by Liz Courtney, looks at the effects of climate change on our coral reefs. 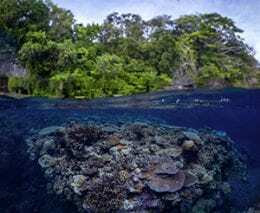 Acid Ocean, a feature documentary by Sally Ingleton, looks at the effects of ocean acidification on coral reefs – it’s a frightening look into our not-too-distant future. Also including in the line up was Yann Arthus-Bertrand’s Planet Ocean, a graphic representation of how important oceans are to our existence and the many and varied ways we are polluting them. 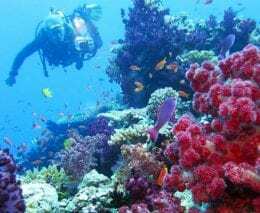 In parts of the world up to 80 per cent of coral reefs have disappeared and closer to home, we have already lost over 50 percent of the Great Barrier Reef. Scientists predict it will disappear completely within 10 years unless we take serious action now. It may in fact already be too late. Our oceans are under threat from climate change, pollution, over-fishing and acidification due to an increase in the amount of carbon they absorb. They produce over 50 per cent of the world’s atmospheric oxygen and are home to between 50 and 80 per cent of life on earth. We are all aware of the plight of the world’s rainforests and there are plenty of initiatives the world over to replant trees and buy back tracts of land. Why is there such little awareness of the plight of our oceans? How can we citizen scientists help? Part of the Festival line-up was a panel discussion that brought together scientists, storytellers and activists to discuss just that. The scientists included marine ecologists Professor Natalie Moltschaniwksyj, University of Newcastle and Dr Gretta Pecl, Institute for Marine and Antarctic Studies (IMAS) and Dr Alan Jordan from the NSW Department of Primary Industries. Left to right, Dr Alan Jordan, Tim Silverwood, Dr Greta Pecl, Prof. Natalie Moltschaniwsky, David Hannan and Jerry Jackson. Storytellers were represented by filmmakers Sally Ingleton and David Hannan, and activists by Take 3‘s Tim Silverwood, plastic pollution campaigner and avid surfer. Everyone seemed to agree that education was the key, and the best way to help was at a grass roots level; whether that’s getting involved in a local clean up, lobbying our MPs to act, or contributing to citizen science projects such as Redmap. One fantastic educational initiative is David Hannan’s Ocean Ark Alliance. With the largest collection of educational and scientific resources on the planet, the Ocean Ark Alliance aims to create a deeper appreciation of coral reefs, coastal communities and polar biomes. 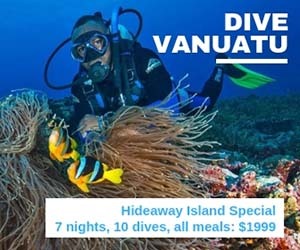 Its members include world-renowned scientists; underwater explorers, filmmakers and marine artists who have come together to endow this amazing asset to any school or not-for-profit organization interested in sharing a deeper understanding of the marine environment. 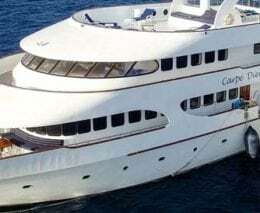 Catlin Seaview Survey. Snapshot of Lady Elliot Island. 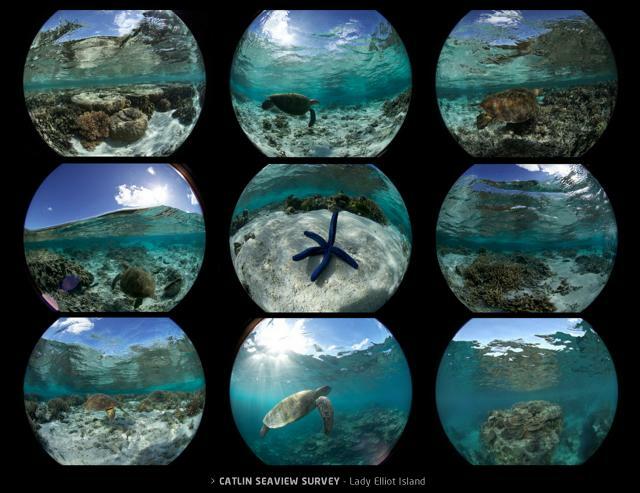 The Catlin Seaview Survey, an impressive global photographic project run in partnership with Google, aims to create a baseline record of the world’s coral reefs, in high-resolution 360-degree panoramic vision. 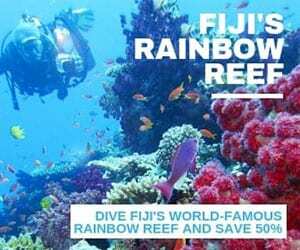 It will hopefully enable change to be clearly monitored over time and help scientists, policy makers and the public at large to see and understand the issues reefs are facing and work out what needs to be done to best protect coral reefs now and into the future. The Redmap team prepare for the launch of the new iPhone app. 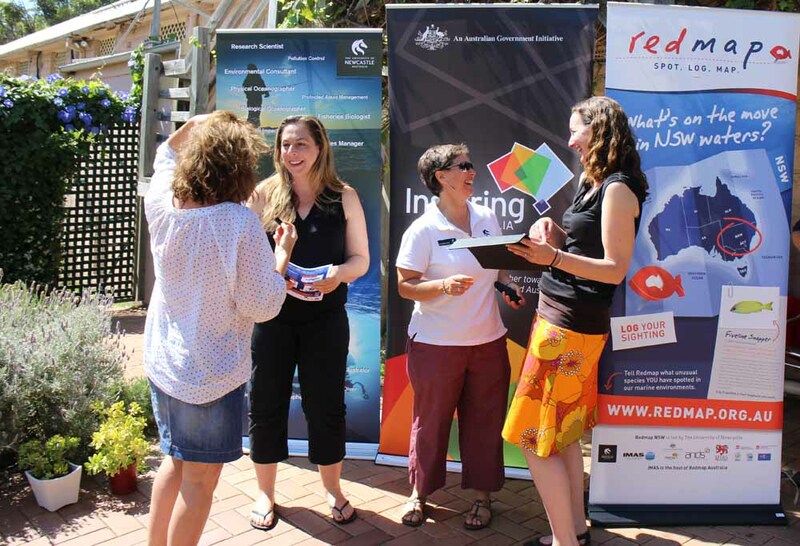 Redmap Australia, an IMAS initiative, is a nationwide citizen science project that allows fishers and divers to report sightings of unusual fish and marine species, enabling scientists to track the effects of global warming. These community observations help scientists track which species are shifting their usual home range in response to warming seas. The free Redmap iPhone app was launched at the Festival, which makes it even easier to report sightings with just a few clicks on your phone. The Festival was the brainchild and vision of Jerry Jackson, an acclaimed Hollywood writer/director/producer who now calls the Central Coast home. He is to be congratulated for pulling together an incredible group of storytellers to help celebrate our oceans and create awareness of their uncertain future. This inaugural Festival will hopefully now cement its place on the calendar as a regular annual Central Coast event. This entry was posted in Marine Environment and tagged Under the Sea Film Festival, Take 3, Ocean Ark Alliance, Caitlin Seaview Survey, Tipping Points: Oceans. Bookmark the permalink.